Gureryne Selvilo is a Dunmer healer at the Chapel of Stendarr in Chorrol. Gureryne lives his life in accordance with the Ten Commands of the Nine Divines and spends most of his time helping out whenever he can. After waking up early at 6am, he heads upstairs to the main chapel and spends two hours wandering around and talking to the primate, Otius Loran. At 8am, he receives several blessings from the altar of Talos and afterwards finds a pew for one hour of silence. He gets up at 10am and proceeds to walk around the chapel until he exits at midday. He heads for the statue of the Saint of Sancre Tor near the southern gate, then wanders the area for the next four hours. After that, he enters Northern Goods and Trade for two hours of browsing around and chatting with the proprietor Seed-Neeus. At 6pm, he returns to the chapel and eats his dinner on one of the pews for two hours. After four more hours in the chapel, he heads down to the chapel hall and finds his bed at midnight. He wears an expensive set of upper-class clothing consisting of a blue velvet outfit along with a pair of green velvet shoes. He also carries around a green silk garment and a considerable amount of gold. He knows a standard set of healer spells with extra major restorative magic. When you meet him for the first time, he will politely welcome you to the Chapel of Stendarr: "I'm the chapel healer, Gureryne Selvilo. We're glad to see you paying your respects here at the chapel." He will also provide you with a bit of background information: "In Chorrol, we Highlanders treat our Gods' teachings as rules to live by. Our lives are governed by the Ten Commands." If you have installed the Knights of the Nine official plug-in and started the quest Stendarr's Mercy, Gureryne will point you towards newcomer Areldur for information on the Gauntlets of the Crusader: "Oh, those. You'll want to speak to Areldur about them. He's in charge of keeping people away from them." 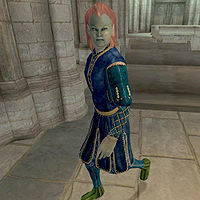 When you ask around town, the citizens of Chorrol will show great gratitude towards their resident healer: "Thank Stendarr for the chapel here in Chorrol. A lovely place, and the healers are excellent." There is also a female Dunmer in Tribunal with the name Gureryne Selvilo, although there doesn't appear to be any relation between the two. Gureryne will repeatedly activate the Shrine of Talos when he receives his daily blessing there.